I gotta say, these little squirrels are tricky! They’re all over the place here at OSU and sometimes they literally let you walk right up to them without moving an inch. But then other times they scurry away at the first sign of a human! It’s like Forrest Gump said, you never know what you’re gonna get. That was certainly the case here, especially since I wasn’t actually trying to get a picture of a squirrel at all. I saw this little guy sitting on a cypress knee munching on some kind of nut or acorn, and had one of those “I can’t believe I might get this shot” moments. Every element was lining up perfectly: I had my camera, the light was good, the squirrel was kind of unaware of my presence, and…then I remembered I had my 50mm lens instead of something much better suited for this type of picture. But heeding Gump’s Words of Wisdom I went ahead and fired off a few shots (at f/1.8 to get a shallow depth of field even though I risked getting an out-of-focus rodent) and hoped for the best. I wasn’t all that optimistic for the picture until I loaded it up into Lightroom and found that I could get away with cropping it quite a bit and still have a decent picture. 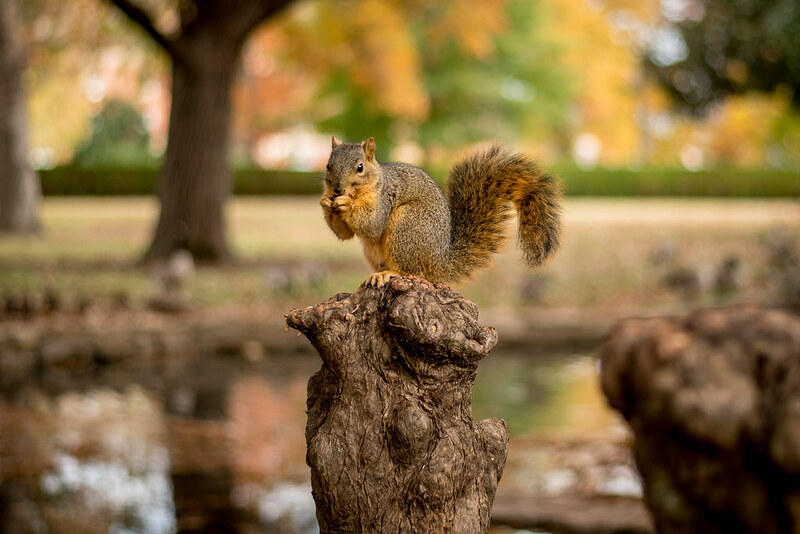 That’s the problem with a 50mm lens: it’s just not that good for shooting long-distance shooting images of, say, a squirrel on a wooden stalagmite. But the nice thing about using it on a 24mp camera is that you can crop in quite a bit and still have plenty of sharpness and detail, provided you get your settings right and don’t miss focus. Such was the case here and even though a longer lens would have helped isolate the squirrel from the background I think I’m pretty happy with how it turned out. That’s a great shot! I wonder if it is one of MY squirrels. Thanks for sharing how you were able to get this shot even though you didn’t have the ideal equipment with you. But, had you had some other lens, then we would not have seen the image on this blog. This is a really nice shot with such precise focus on the squirrel’s eye. You’re right about that Dennis! I have several shots taken with my 70-200 lens that I can’t post here :) Thank you for your nice comments about the squirrel photo! Great shot, may our Lord continue to bless you and the work you do. Thank you Daniel, and God bless you too! Ah, an impressive photo the Tree Rat! !